A beautiful�vintage vase by Carlton Ware in the�Spiders Web pattern�in the rouge royale colourway which was introduced in the 1950's.� It carries the standard Carlton Ware backstamp used during this period.� It also has the impressed number 1640 which refers to the shape. 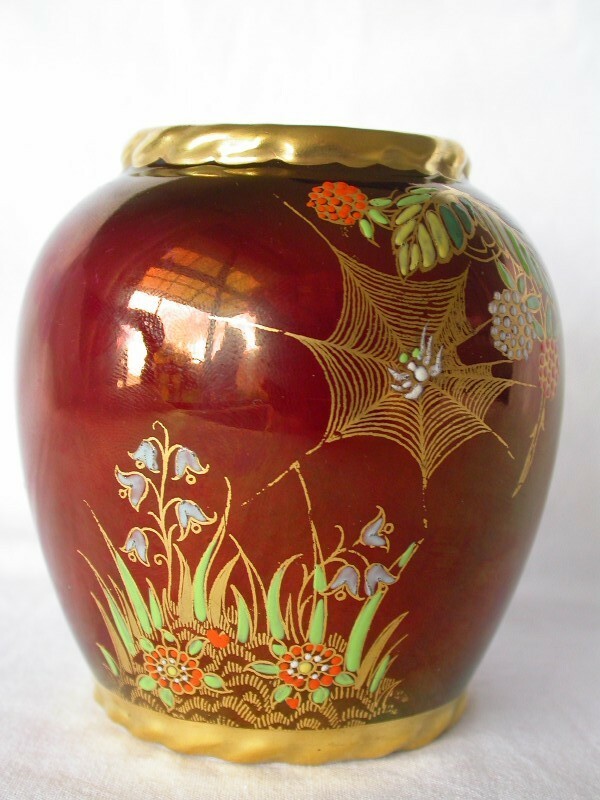 This much sort after pattern features a spider in a web, together with a butterfly and dragonfly amid surrounds of flowers, leaves and bluebells.� They are hand-painted on a rouge ground.� The inside of the vase has a mother of pearl lustre. It is in excellent condition having no repairs, chips, cracks or stains.� It has�very minor crazing to the base only, which is unusual for a piece of this age.� The rouge ground and gold trim are�in excellent condition.� The colours are bright and vivid and this vase displays brilliantly.